Federal National Mortgage Association (Fannie Mae) is a federally chartered corporation that purchases mortgages. Fannie Mae is a government-sponsored enterprise (GSE) chartered by the United States Congress to support liquidity and stability in the secondary mortgage market, where mortgage loans are purchased and sold. It also makes other investments that increase the supply of affordable housing. 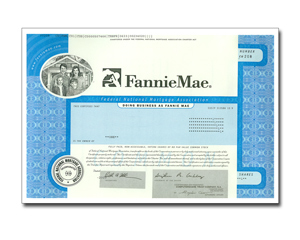 Fannie Mae stock was one of the casualties of the bursting housing bubble making it an interesting collectible.